Mum To Be will know right where to sit when you set off her chair with one of these adorable Umbrellaphants Boy foil Balloons tied to the back of it, featuring the sweetest boy baby elephant holding up a polka dot umbrella in a shower of hearts. 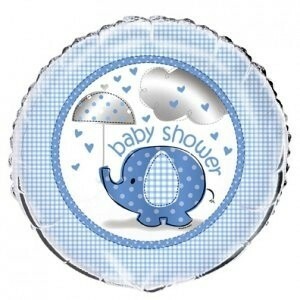 Mum To Be will know right where to sit when you set off her chair with one of these adorable Umbrellaphants Boy foil Balloons tied to the back of it, featuring the sweetest boy baby elephant holding up a polka dot umbrella in a shower of hearts. These balloons are also great in balloon bouquets for table decorations or tied to your gate post or door to direct guests to your house! Requires helium filling which we suggest you obtain locally.